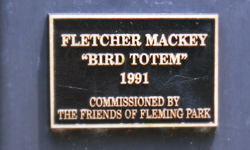 The Friends of Fleming Park donated this wooden sculpture to the City of Houston in 1991. 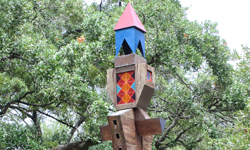 It was inspired by Native American totem poles from the Pacific Northwest, and incorporates a birdhouse. Fletcher Mackey is a native Houstonian born in 1950. He received a Masters in Fine Art degree from California Institute of the Arts and works as a professor at the Maryland Institute College of Art. He has taught at Texas Southern University and Rice University, and is well-known in Houston for having been the Cultural Program Director at Project Row Houses.